Most of us don't know how to deal with flow charts when we are novice users but with the passage of time and experience we gain expertise. A good flow chart helps to understand the systematic flow of information in the system. If a flow chart is not created properly then it may mislead the designer of the system or may result in fatigue consequences. Therefore, it is very important that you create flow chart with caution and expertise. I would always suggest you to use flow chart to ease the process of understanding the system and its flow. Although there are many symbols that can be used in flowcharts to represent different kinds of steps, accurate flowcharts can be created using very few (e.g. Process, Decision, Start, delay, cloud). The basic element of a flowchart is a simple action, which can be anything from striking an anvil to making a cash payment, and is represented as a box containing a description of the action. The mapping of 'what follows what' is shown with arrows between sequential action boxes, as in the illustration. This also shows the boxes for flowchart start and end points of which there are normally one each. Processes become more complex when decisions must be made on which, out of an alternative set of actions, must be taken. The decision is shown in a Flowchart as a diamond-shaped box containing a simple question to which the answer is 'yes' or 'no' as in Fig. 2. More complex decisions are made up of combinations of simple decision boxes. Where boxes cannot be directly connected with lines, the separated lines are coordinated with connector boxes containing matching names. This typically occurs where lines cross onto another page, as in the illustration. By using multiple connector boxes, it is very easy for flowcharts to become very large, although this is usually self-defeating, as the Flowchart then becomes difficult to understand. The ideal size for a Flowchart is one page, as this gives a single visual 'chunk' that is reasonably easy to understand as a single item. Large processes can be broken down into a hierarchical set of smaller Flowcharts by representing a lower level process as a single sub-process box. This behaves like a normal action box at the higher level, but can be 'zoomed into' to expose another Flowchart, as in Fig. 4. An additional 'action' box that can be useful when analyzing processes is the wait box, which highlights a delay (i.e. no action), as in the illustration. This is a typical point where the overall cost of a process may be improved by acting, possibly on other processes, to reduce the delay. Flowcharts are helpful in understanding a complicated process. ConceptDraw DIAGRAM allows you to create professional flowchart quickly and easily. 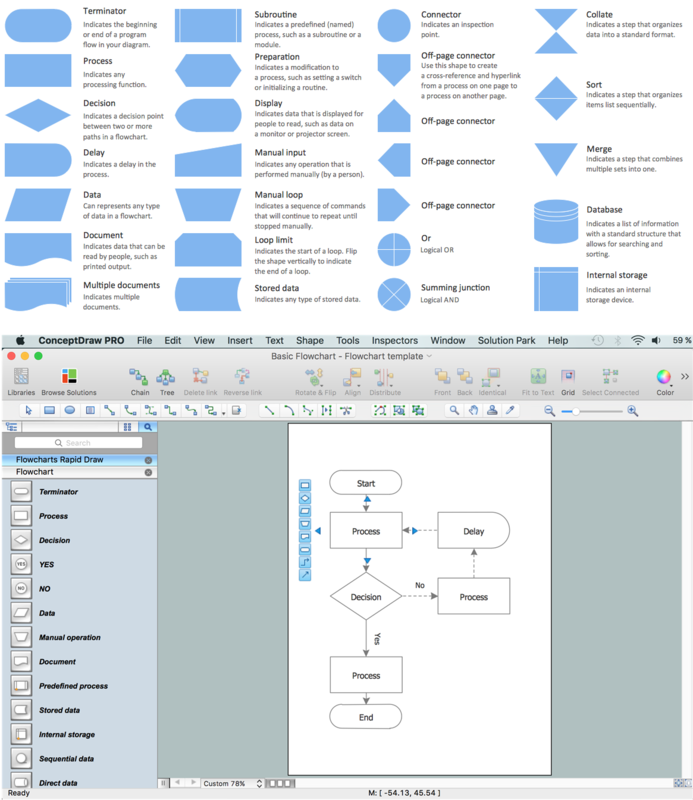 Open a ConceptDraw DIAGRAM new document and select the Flowchart library. Add the proper flowchart elements to the diagram by dragging them from the library to the document page. The flowchart should be started and ended with the terminator symbol. Use the Decision symbol to ask a question. The Process symbol is used for activities or action steps. A circle symbol containing a letter or number means that this chart connects to another chart on a different page. Add the first box below the start box, identifying the first action simply by asking, 'What happens first?'. Add an appropriate box around it. With the flowchart drawing software, it's easier to draw a professional looking flowchart. You needn't take care of the drawing skill. Only understand the whole process flowchart. Edraw flowchart software can help to quickly create new flowcharts, workflow, NS Diagram, BPMN Diagram, Cross-functional flowcharts, data flow diagrams and highlight flowcharts. 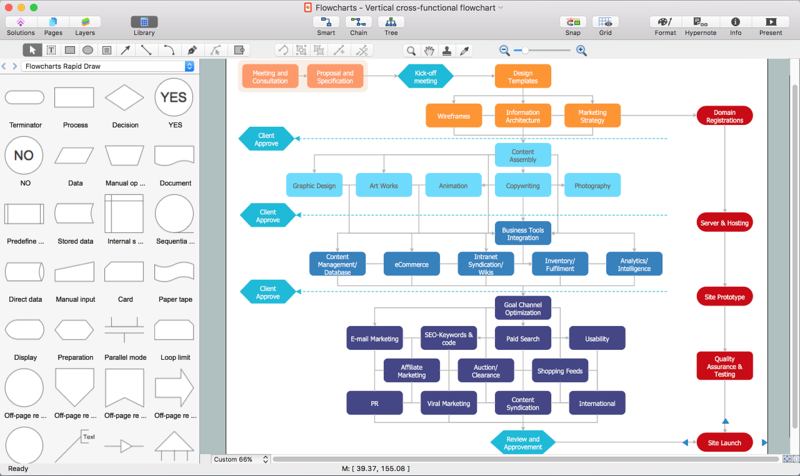 Use ConceptDraw DIAGRAM v12 diagramming and business graphics software to draw your own flowcharts of business processes.